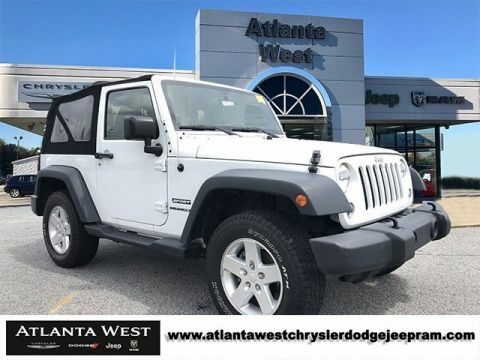 17" x 7.5" Aluminum Wheels, 8 Speakers, Air Conditioning, Anti-Spin Differential Rear Axle, Audio Jack Input for Mobile Devices, Auto-Dimming Mirror w/Reading Lamp, CD player, Chrome/Leather Wrapped Shift Knob, Class II Receiver Hitch, Connectivity Group, Deep Tint Sunscreen Windows, Electronic Stability Control, Front 1-Touch Down Power Windows, Front fog lights, Integrated roll-over protection, Leather Wrapped Steering Wheel, Max Tow Package, Outside temperature display, Power Convenience Group, Power Heated Mirrors, Power Locks, Quick Order Package 23S, Radio: 130, Remote Keyless Entry, Remote USB Port, Security Alarm, SIRIUS Satellite Radio, Steering wheel mounted audio controls, Sunrider Soft Top, Tire Pressure Monitoring Display, Traction control, Trailer Tow w/4-Pin Connector Wiring, Uconnect Voice Command w/Bluetooth, Vehicle Information Center. Priced below KBB Fair Purchase Price! Certified. 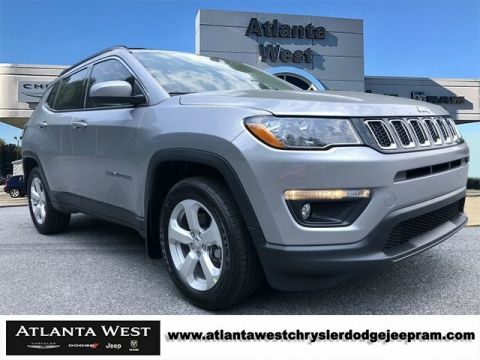 #1 CERTIFIED DEALER IN TOWN. HUGH SELECTION OF CERTIFIED PRE-OWNED. 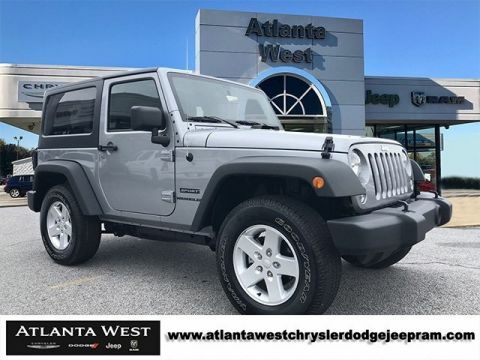 www.atlantawestchryslerdodgejeepram.com , Call 770-942-1102 . 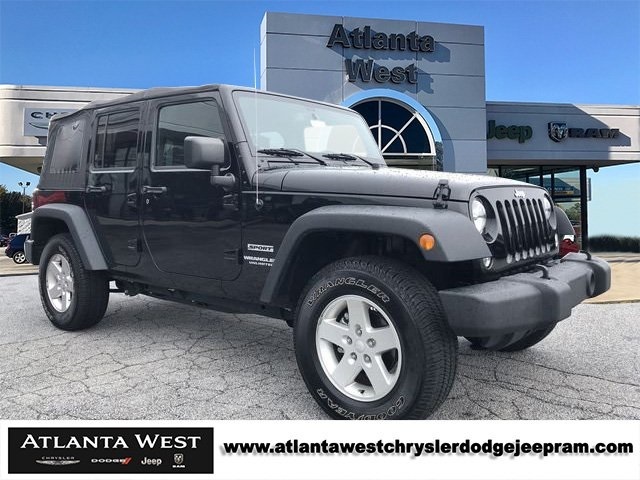 Excellent selection of New and Used Vehicles, Financing Options, Serving Lithia Springs, Hiram, Dallas, Marietta, Douglasville, Mableton, Powder Springs, Smyrna, Vinings, Palmetto, Villia Rica, the Greater Atlanta area, Cobb County, Paulding County, Douglas County, Fulton County, Smyrna County.